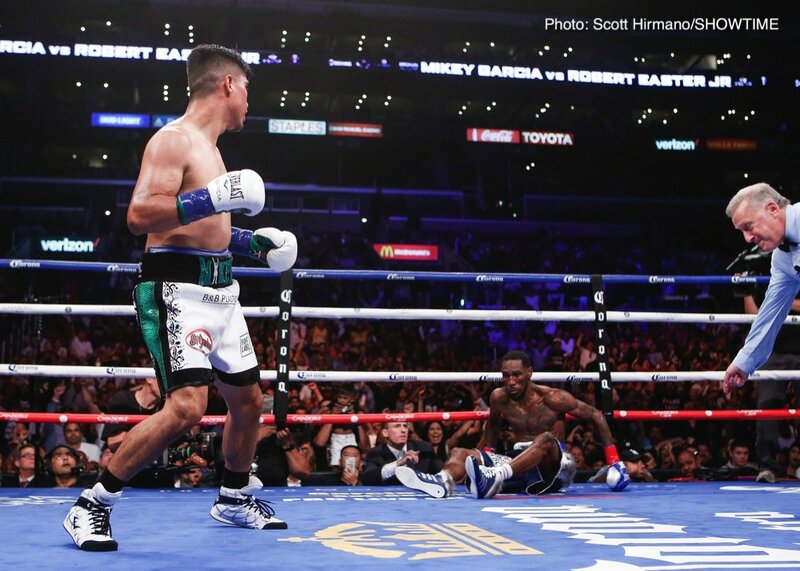 Mikey Garcia did the business last night in soundly defeating a dangerous foe in Robert Easter Junior to become only the tenth unified lightweight champion in boxing history. Of more importance to Garcia, now 39-0(30), than the addition of another 135 pound belt is the fact that his dream fight with welterweight ruler Errol Spence remains very much alive. Spence, who was at ringside last night, scouting his possible next challenger, is certainly not pouring cold water on the fight. In fact, the reigning, unbeaten IBF 147 pound champ says he very much wants the fight. Garcia shocked everyone when he first called for it – he did, after all, win his first world title down at 126 pounds and would be/will be giving away plenty of weight in a fight with the far bigger Spence – but it now seems there is an excellent chance Spence-Garcia will go down before the end of the year. Garcia, who dropped Easter along the way to winning by lopsided scores on the cards of all three judges, said after the fight that he is currently “better than ever” and that he wants the “biggest challenge” and that’s a fight with southpaw sensation Spence. Spence, who has been the IBF welterweight champ for a little over a year, said he is up for Garcia’s challenge. The fight may well happen though. And if Garcia, who truly is trying to dare to be great, can actually win it, he will not only be armed with a very strong argument for holding the mythical P-4-P crown, but Mikey may also have to be referred to from there on in as not only a great, but as an all-time great.